Looking to increase headcount in the remaining months of 2017? You’re not alone – according to the latest ManpowerGroup Employment Outlook Survey (MEOS), Singaporean employers reported steady hiring intentions for the final quarter of 2017. Interviewing over 59,000 employers across 43 countries, including 700 in Singapore, ManpowerGroup found that 16% of employers were expecting to increase staffing levels. On the other hand, 5% forecasted a decrease while 74% anticipated no change. This places Singapore’s Net Employment Outlook at +11% – the strongest forecast in two years. When compared to the previous quarter, hiring prospects were found to be 7 percentage points stronger, and 4 percentage points stronger when compared with the final quarter of 2016. 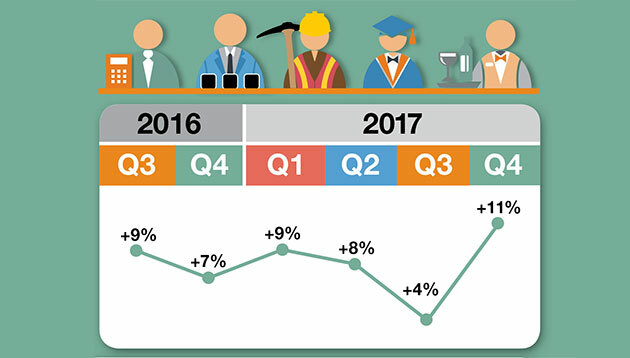 Job gains were expected across all organisation sizes with large-sized employers (250 or more employees) reporting a Net Employment Outlook of +19%; the outlook for medium-sized businesses (50-249 employees) stood at +14%; small-sized businesses (10-49 employees) reported a outlook of +10%; while Micro employers were the most cautious with an outlook of +7%. “Although there’s a renewed confidence amongst employers, many remain wary and are adopting the wait-and-see mentality amidst worries that trade numbers could weaken and domestic demand may stall despite the potential pickup in trade,” she added. Among the seven industry sectors (finance insurance and real estate, manufacturing, mining and construction, public administration and education, services, transportation and utilities, and wholesale trade and retail trade) employers in six sectors expected to grow payrolls during 4Q 2017. Public administration and education sector employers reported the strongest hiring plans with a Net Employment Outlook of +22%. While uncertain hiring plans were reported in the mining and construction sector with an Outlook of -1%. Elsewhere, employers in the services sector and the transportation and utilities sector forecasted a steady increase in staffing levels with Outlooks of +18% and +17%, respectively. Employers in the finance, insurance and real estate sector employers anticipated some job gains with an Outlook of +8%, while Outlooks stand at +7% in the wholesale and retail trade sector and at +3% in the manufacturing sector. READ MORE: What are your biggest deal-breakers when hiring? “The stronger hiring outlook in the services sector reflects the expected surge in demand for IT specialists, especially those dealing with cyber operations and cyber security as more companies go digital,” Teo commented, in response to the upbeat forecast in the services sector. During the October-December time frame, Payrolls were forecasted to grow in all eight countries and territories surveyed in Asia Pacific. Compared to Q3 2017, hiring prospects improved in Singapore (+7%), India (+4%), Hong Kong (+2%), China (+2%), and Australia (+1%); declined in New Zealand (-2%) and Taiwan (-1%); and remained unchanged in Japan. When compared to Q4 2016, forecasts strengthened in four countries ( Hong Kong, Singapore, China, and Taiwan), declined in three (India, New Zealand, and Australia) and was unchanged in one (Japan). There are plenty of advantages to using cloud computing in HR, but what are the risks? Join us at HR Tech Interactive 2013 this mo..